The Workshop Wall is a display of quilts, garments and three-dimensional pieces made in EBHQ workshops using new, interesting techniques and design concepts. The goal of the exhibit is to showcase a wide range of these techniques, materials, and designs, publicize our guild’s activities, and promote involvement. You can enter as many as three pieces to exhibit here in addition to any quilts or garments you submit for the regular show. Because we are putting the display together in a limited space, please submit small items. This can be just a block or a few blocks. Your entry can be a work in progress. It does not have to be finished. Please help us to promote our guild and wonderful workshops by entering something that you have made. You are not expected to volunteer time when you exhibit on the workshop wall, as you are if you enter a quilt or a garment in the show. 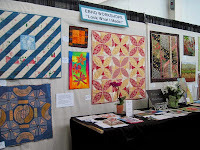 However, if you have an obligation to volunteer for submitting a garment or quilt in the show, it would be appreciated if you would volunteer time to work at the Workshop Wall exhibit. 1. You may submit multiple entries; complete a separate form for each entry. 2. You may submit entries for the workshop promotion wall in addition to any quilts or garment you submit to the main body of the show. 3. We prefer work submitted to be completed, but work in progress may be considered if it clearly illustrates a process learned (dye painting samples, etc). 4. Acceptance of your entry and completed paperwork does not guarantee that your work will be exhibited as space is limited. If your work is not exhibited you will be notified by phone to make arrangements to return it to you. 5. By submitting your entry, you give permission for your name to be used and your entry to be photographed, recorded, displayed on a Web site, or used in any publicity deemed appropriate by EBHQ or its representatives. 6. The maximum size for a quilt is 60 inches by 60 inches. 7. Each quilt must have a 4 inch sleeve securely sewn to the back of the quilt one inch below the top edge of the quilt. 8. Each entry must have a label with your name and address on it securely attached to the item. Three-dimensional pieces must have a hidden tag securely attached to the item, with the maker's name and address written on it. 9. You must complete the section at the bottom of the entry form for the Insurance Waiver and Assumption of Loss Release. 10. Workshop entries must be delivered and picked up. Do not mail them. If you cannot deliver or pick up yourself, you may have someone else do so for you. January 29, 2018: Deadline to submit online entry form(s). March 10, 2018: Deliver Workshop Wall entries to the home of Cindi Cossen, 5624 Huntington Ave, Richmond, CA. Monday, March 19, 2018: Contact Joan Sextro to arrange pick up of any remaining show entries.